Focusing on managing Texas wildlife habitat and natural resources for native and exotic wild game species, for this and future generation of hunters and outdoor enthusiasts. How common are birds big enough for trophy wild turkey hunts in Texas? 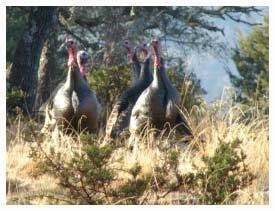 Texas, especially the Hill Country area, is home to over 600,000 Rio Grande Turkeys. While they are not all toms and definitely not all the large trophy size, they are still very, very plentiful. This natural abundance of turkeys in the area means that hunters are sure to get hunting action in both the spring and fall seasons. Like with many other species on Escondido Ranch, the river area is one of the most popular areas for turkey hunting in both seasons. Turkeys are naturally attracted to the ready supply of water along with the vegetation and insects that are found along the wet areas of the river. The brushy areas beside the river banks also provide ideal cover during the day, making the area of the ranch perfect for trophy wild turkey hunts. How are the Rio Grande Turkeys kept on the ranch? The simple answer to that question is that they aren't. The turkeys are able to wander in and out of the ranch since it would be almost impossible to keep them confined. Rio Grande Turkeys do have the ability to fly for short distances and they do fly up into trees to roost, meaning they can easily get out over any type of game fence. The two square miles of Escondido Ranch provide the best possible terrain and environment for Rio Grande turkeys, meaning that more turkeys come into the ranch than leave, even counting the toms that are taken in trophy wild turkey hunts. This never ending natural supply of turkeys to the ranch ensures that there are always turkeys in the area for hunting and just enjoying in the early morning hours of the day. What do Rio Grande Turkeys eat? Part of the reason that turkeys find the Escondido Ranch a favorable place to live is that they have the opportunity to eat the grains provided at the feeders. This readily available source of food for the turkeys ensures that they both stick around the ranch plus they tend to spend a great deal of time in the areas around the river and the feeders. The turkeys also eat natural vegetation, seeds, worms and insects and fruit and berries they find on the wild plants on the ranch and surrounding areas. One of the advantages of the turkeys learning to come to the feeders means that sometimes, such in the fall, the turkey season will overlap with another species, specifically that of the whitetail deer. This gives hunters in this season the opportunity to go on trophy wild turkey hunts as well as trophy whitetail hunts all on the same piece of managed hunting reserve. These double hunting options make Texas hunting both practical as well as a lot of fun for hunters as there are hunting options galore. Keep in mind there are several exotic species on the ranch with no pre-set seasons so it is possible to hunt for in season turkeys and whitetail as well as exotics, making it a exceptional hunting opportunity for novice or experienced hunters alike. What is the season for Texas trophy boar hunting? 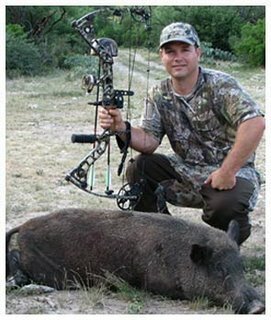 Texas trophy boar hunting goes year round for both feral hogs as well as Russian boars. Since these animals reproduce at a terrific rate and are almost free from any type of natural predator there is no need to worry about managing the size of the herd other than by harvesting too many older sows during any one year. Typically all litters are born about 1 to 1 ratio of males to females, leaving a lot of options for Texas trophy boar hunting without impacting the breeding population. Regular harvesting of the older and younger boars on the Escondido Ranch keeps all the hogs in better shape since there is less competition between boars during the breeding season. Can Texas trophy boar hunting animals be used for meat? Yes, feral hogs, especially the younger hogs, provide great meat that is almost the same as domestic pork. There are many different recipes for wild hogs including making sausages and ground pork, roasts, stews and of course great pork ribs for the barbeque. Is it possible tell how old the hog you shoot is when Texas trophy boar hunting? Looking at the Russian boar or feral hogs jaw can help you come very close to deciding how old the hog or boar is. You can also tell if the hog has any European boar heritage by examining the area of the jaw between the tusk and the regular molar teeth. If there is a small isolated tooth in the middle, there is some European breed in the background of the hog. This is not at all uncommon in Texas where Russian boars and even domestic European swine breeds have bred with the wild hog populations. A feral hog that is under 2 years of age will have three adjacent teeth at the back of the lower jaw. There will be two smaller teeth in front and a molar looking tooth at the back. After two years of age there will be an additional molar that pops up at the back of the lower jaw, giving a total of four teeth. Despite common theories that you can use tusks to age a Texas trophy boar that is not a accurate means to age an animal. Until the age of three the two smaller teeth in this group of four will gradually be replaced by thicker, heavier, molar like teeth, very different than the previous teeth that looked a bit like canine teeth. At years three and four additional molars appear, so at the end of the wild hog's fourth year he will have six teeth at the back of the jaw. At the fifth year the final tooth will be fully showing and the teeth will start to show wear and grinding down. After the fifth year is possible to tell the approximate age based on the amount of wear of all the teeth, but this is really just an educated estimate. What makes Escondido a unique Texas exotic hunting ranch? 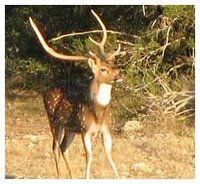 Besides the historical roots of the ranch, Escondido is a unique Texas exotic hunting ranch that has been in business since 1980. This means that the herds have been monitored and managed for optimum trophy animals as well as herd numbers and health for almost 30 years. While other Texas exotic hunting ranches may have over hunted their land area, the staff at Escondido has used a balanced management approach right from the start. Healthy stock is the norm at the ranch, leading to good production from does as well as ensuring a good hunt for those that want to hunt both exotics and native species. The added plus is the river running through the almost 2 square mile area, ensuring the best possible living conditions for a wide variety of native and non-native species. What all comes with the cost of the hunt? Every Texas exotic hunting ranch has different pricing options depending on the services that they offer. 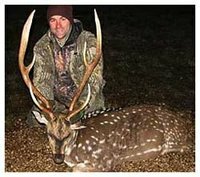 Escondido Ranch offers 15 different hunting options ranging from seasonal hunts for Whitetail does and bucks, bull Elk and Rio Grande Turkeys through to year round hunts for cow Elk, Aoudad sheep; Axis, Fallow and Sika deer, Russian boars and feral hogs as well as Blackbuck Antelope. Each species is individually priced for the hunt, with trophy bucks for Whitetail priced according to their B/C score. In addition to the animal that they successfully hunt, each hunter also receives guided support for hunting including hunting tips and advice from a professional guide. The guides will also clean and quarter the animals and prepare them for packing into the hunter's coolers or ice chest for transport. Hunters can use the main lodge area and can also arrange for meals and accommodations through Escondido Ranch. Where did the exotic species come from on Texas exotic hunting ranches? All the exotic species have been imported from their native countries, most several generations ago. Some of the species were imported in the early 1900's and then spread into wild populations that were reclaimed and managed on Texas exotic hunting ranches, typically in the central and southern parts of the state. Usually the importing was done by avid hunters and landowners that noticed the resemblance and similarity between the climate of south central Texas and the specie's native range. In some cases exotic species are still imported from other ranches and states to prevent inbreeding and keep the genetic balance within the herds. Some of the wild native species such as the Whitetail deer, Rio Grande Turkeys and the feral hogs may naturally move in and out of the ranch based on natural movement and seasonal patterns. Animals on Texas exotic hunting ranches are allowed to live as wild and natural as possible, but they are also fed on a regular basis and treated for any health conditions that arise. The goal of staff is to maintain a healthy, viable but wild herd that provides hunters with a unique, challenging and very out of the ordinary hunting experience. Where did the name Rio Grande come from for this Texas turkey species? Although the Rio Grande River only goes through a portion of Texas, it is perhaps the best known waterway in the state. The Texas turkey, which is the Rio Grande species, is named for its attraction to the riverbeds and areas along the Rio Grande River. They use cottonwood trees for roosting, so the moist and lowland areas along the river provide the perfect natural nesting area. Besides being found in Texas this turkey species is also common in Oklahoma, New Mexico, Nevada, Washington, Wyoming, Oregon, Utah, South Dakota, California, Kansas and the northeastern part of the country of Mexico. 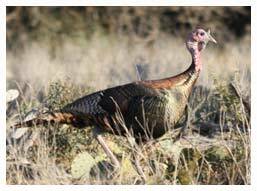 Texas has the largest wild and managed population of Rio Grande Turkeys with an estimated number of over 600,000. They tend to be found only in areas where there is some form of natural water, however many venture miles from the river, stream or waterway during their travels. Are Texas turkeys confined at Escondido Ranch? The turkeys are able to move about through the ranch, however they are not confined by the game fence. Since the birds are rather nomadic and move from summer and winter feeding areas they have free run of the ranch and the surrounding areas. With the river running through Escondido along with the brushy areas and the excellent feeding locations along the riverbed most of the turkeys stay within the ranch itself year round. The mesquite, scrub oak and juniper trees that can be found on the ranch are ideal for the needs of the Texas turkey, especially their attraction for shady, well covered areas to hide during the daily light hours. Despite their attraction for the brushy areas, they prefer open spaces to feed, making them an excellent hunting species. What are the mating rituals of the turkey? During the mating season the tom (male) Texas turkey is often seen strutting around displaying his impressive tail spread. The coloration can vary on the tail but is typically a dark black rump with cinnamon to buff colored tail feathers tipped with tan or very pale buff colors. The contrast in colors makes a beautiful display and something that is really amazing to see. During the strutting the head of the tom can vary in color from a slate blue color through to white or even a dark blue through to a reddish color. The waddles are very pronounced and a deep, rich red color. The Texas turkey toms have spurs or long protrusions from the backs of their legs. They can be used in fighting off other toms, however they are largely just for show as is the impressive tail display. During strutting the tom puffs out all the feathers on the body and slightly elevates the wings in an attempt to look bigger than any other toms around to impress the much smaller hens. There are lots of calls exchanged during the courtship season with the toms very vocal first thing in the morning through to the mid morning range. After that they are more isolated and quiet until the next morning. Where is the best terrain to hunt Axis deer? The Axis deer likes a very particular type of terrain and thankfully it is one that makes for great hunting. They tend to favor being on flat to gently rolling land and avoid the really rugged and rocky areas. At most times of the day they can be found just on the outside of bluffs and wooded areas where there is a lot of natural moisture and dew on the grasses and forage first thing in the mornings. Axis deer prefer shorter grasses that are under 10cm in height, feasting on switchgrass and paspalum as well as some sumac and live oak for additional forage. In the rut the males make bugling calls to announce their presence and both does and bucks will produce alarm sounds that are like short barks when they are disturbed or frightened. The herds, which will vary from relatively small to over 100 animals, tend to follow relatively predictable movements, meaning that hunters and guides can be assured of finding a herd by simply knowing the pattern of movement. Since bucks have hard horns according to when they are born, in most axis herds there will be bucks with velvet antlers, bucks with hard horned antlers, and bucks that have shed their antlers. Some hunters prefer to harvest bucks with velvet antlers which makes for an unusual impressive mount. Because there are bucks available with hard or velvet antlers year round, axis deer are one of the few species that are hunted year round. How are the Axis deer managed on a hunting ranch like Escondido? On a large managed hunting ranch such as the Escondido Ranch there are literally hundreds of acres of natural habitat for the deer population. This allows the herds to live as they would in wild settings, breeding year round and producing abundant crops of healthy fawns. Since the mating seasons are not restricted or controlled by man, the deer population is kept at peak levels year round. 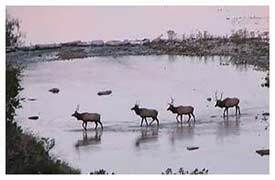 Finally the managers of the ranch are aware of how many bucks and does are harvested by hunters, allowing the range to avoid over grazing or removing too many breeding adults from the population. In years where there are fewer or more fawns produced, managers are then able to make determinations as to the number of adults that can be harvested to keep the population stable. What is the hunting season for Axis deer? Typical deer season in Texas runs from close to the end of November until the first month of the New Year in January. While there are lots of whitetails around and they provide great hunting, the season is very time restrictive plus you have to have permission to hunt on private property, making it tough unless you know a local rancher. Of course you can also book a hunting trip on a private hunting ranch, but you still have to say within the season. Unlike native hunting species, the Axis deer is considered an exotic animal. 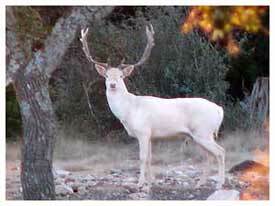 As such there is no prescribed legal hunting season for the species within the state of Texas. This means that hunters can extend their hunting season through booking with a private hunting ranch. Many hunters choose to hunt Axis deer in the summer when some of the largest antlered bucks are harvested and hunting pressure is minimal. What is the reproductive cycle like for these animals? Just like domestic pigs, wild swine are incredibly fertile when the conditions are right. During times of drought, poor vegetation or other contributing factors females will not come into season, keeping the population down and preventing too much competition for existing food supplies. In good years, which are most in Texas, females will start to produce offspring at between 6 to 12 months and will typically have four to eight young but mature sows may have litters of up to 12. It is estimated that the litters are born with an equal number of males to females, and within five years in good conditions a single female and her female offspring could potentially produce 1000 wild hogs. What will feral swine eat? In short, wild hogs will eat anything they find, which is what makes them such as serious problem for farmers and ranches. They will eat grasses, fruits, vegetables, roots, shoots and even carcasses of dead animals. Some wild hogs will also eat live animals such as small rodents, insects, worms, frogs and small birds if they are able to catch these animals. What is the best method to ensure a kill shot while hunting feral hogs? Wild hogs are much more difficult to hit with a kill shot than many of the other species of animals found on Escondido Ranch. Hunters have to have a good understanding of the area of the hog that is most likely to result in a clean kill rather than having to track the animal. Feral hogs are extremely tough and it is very difficult to catch them if they are not serious injured with the first shot. Wild hogs have a very small lungs and a small heart cavity, so shooting accurately is essential. The best place to aim for a clean kill shot is into the middle of the upper shoulder area or slightly to the front into the base of the neck area in a line from the shoulder, another good area to shoot for is behind and below the ear. Shooting behind the elbow or shoulder may not result in a kill since all the vital organs are well protected by the heavy front shoulder muscles and bones, and thick skin. 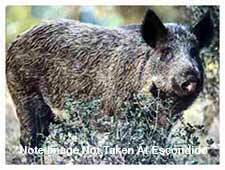 Are feral hogs only found in the central Texas areas around Escondido Ranch? Wild hogs are a serious nuisance problem in most areas of Texas. They can actually be found in very suburban settings however they tend to avoid the large cities that are found throughout the state. Almost any community with rural areas or acreages is going to have some type of feral hog population. In general the hogs will tend to keep out of sight during the daylight hours when people are around, however they will come out at night to root and get into garbage, causing a real problem in some areas. There are feral swine reported in 39 states in the United States and four provinces in Canada. The wild hog range extends well down in to Mexico where they have mated with the domestic hog population, producing a hybrid. It is estimated by a recent A&M Texas study that there are over 2 million wild hogs in the state of Texas and at least another 2 million scattered throughout the other 38 states with populations.